Soursop or graviola is a tropical fruit grown on a very tall evergreen tree. However you won’t find it easily in Canada as it is extremely temperature sensitive and only grows in tropical climates. Before now if you wanted to buy soursop leaves in Canada, it was challenge. The same goes for soursop fruit. In the Caribbean, and places like Jamaica, it grows in people’s backyards or by the road side. It can also be found in South America. And it is farmed in Grenada, Puerto Rico and Colombia. As for leaves, they are a little hardier and easier to ship. 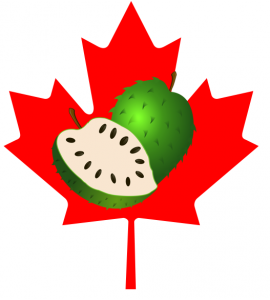 You may be able to to find soursop leaves in health food stores in Toronto and Vancouver and places in between. I personally have seen them in Toronto, and oddly enough, in a stall in Ottawa in the Bytown market. However, this was a one off experience that wasn’t again replicated. We source the leaves from farmers in Malaysia,a s we have found that they are of top quality. The trees are not sprayed. So there is no herbicides or pesticides. So you are getting organic and all natural graviola leaves ready to be made into soursop tea. The same goes for Vancouver. The supply there is usually sourced in Asia (Malaysia, Philippines, and Vietnam grow it). It is also grown in Hawaii. So what is a Canadian to do if they want soursop leaves for cancer treatment? At AboutSoursop.com, you can order them through SoursopStore.com, which . Can I buy soursop leaves in Canada via mail order? 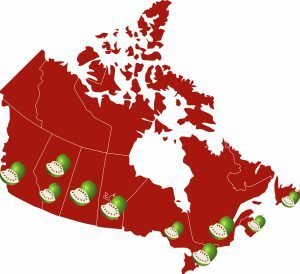 Canadians who want to buy soursop leaves can get them from SoursopStore.com. We of course also ship soursop leaves to all over the United States, sometimes to Mexico, and we also ship our organic soursop leaves to countries beyond North American.